The statement added that “the Bank has no intention to withdraw the above categories and will continue to trade… [Despite the bad translation, in my opinion the CBI is telling the Iraqi citizens that their “old” IQD notes and their “new” IQD notes “…will continue to trade…”] …and naturally,” explaining that “groups carrying specifications and signs of a new high-security protection, in addition to the security tags in categories”. 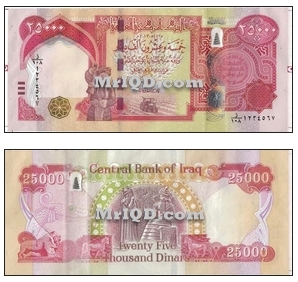 The CBI, revealed in (7 August 2014), that the end of the month of August will see the launch coin ten thousand dinars Bhltha new, and among the old currency from the category of ten thousand will not be withdrawn from Iraqi markets, confirmed that the other categories of currencies Iraq will be put up new forms successively until the end of this year. First, thanks again MarcG for finding this article! Next, I was saying that from my understanding of the article, the CBI is telling us the new 25K IQD and 5K IQD notes will circulate WITH the EXISTING IQD notes. There are Hack Gurus and Con Artists out there that will try to scare you to believe that your current “old” 25K IQD or 5K IQD notes will now be worthless. Don’t Believe THEM!!! That said, then the Hack Guru, will probably have “good news” for you and tell you that if you mail to them, or meet them at a Hotel, they can guarantee that you get your “old” 25K and 5K notes traded in for the “new” notes, so you don’t lose any money! SCAM ALERT! 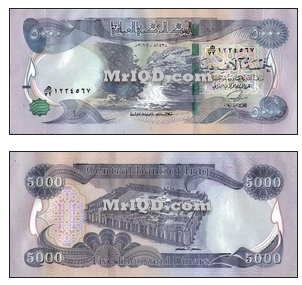 In my opinion, they will get you to mail your “old” 25K and 5K IQD notes in to them, or meet them at a Hotel, then all you will get a “receipt” because they just ran out of the new notes. Or, the shipment didn’t come in via FedEx like it was supposed to. Or, some other more cleaver excuse. Point being…. You leave them your dinar, and they will disappear! Please don’t be fooled in to losing your IQD – keep it locked in your safe, where it belongs for now. This entry was posted in ADVICE, Hack "Gurus", How To Avoid Investing Scams and tagged 25K IQD, 5K IQD, cbi.iq, Central Bank of Iraq, Con Artists, currency, Hack Gurus by MrIQD.com. Bookmark the permalink.